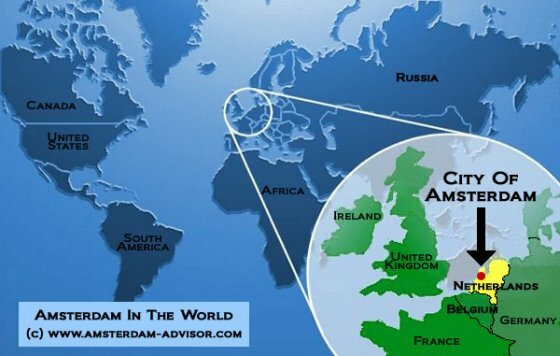 Where is Amsterdam located on the world map, you might be wondering? Amsterdam is the capital city of the Netherlands, and this country is located in North-West Europe between Germany in the east, Belgium in the south, and the North Sea in the north and west. On the map, Amsterdam is located at 52°22' north latitude and 4°53' east longitude (meaning over 52 degrees north of the Equator, which is 0 degrees, and 4 degrees east of London, which was once defined as 0 degrees). 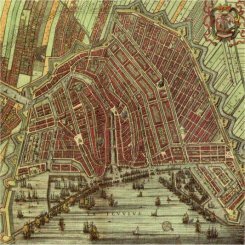 The Netherlands are sometimes popularly called 'Holland', but actually Holland refers to the western provinces of North-Holland and South-Holland within the Netherlands (who were politically dominant over the others). The inhabitants of the Netherlands are called the Dutch. How far is Amsterdam from some major world capitals? Here are the details. The flying times refer to commercial airliners, and are averages. 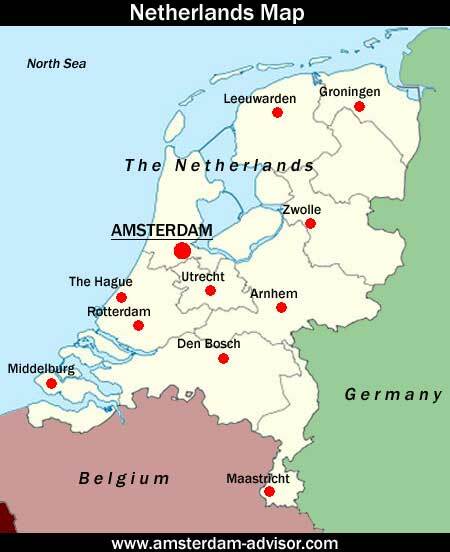 Where Is Amsterdam Within The Netherlands? Sometimes foreigners mistakenly think that The Hague is the capital of the Netherlands, because the Dutch government is located there. Amsterdam is clearly the cultural capital of the Netherlands, though: it has the biggest museums, the leading orchestras, two universities, most national newspapers and a thriving art scene. It's a popular tourist destination: 4 million tourists annually come to see the old city center's architecture and canals, visit the museums and experience the liberal, international culture. Here are the distances between some bigger Dutch cities/towns and Amsterdam, and the approximate driving time by car.